Bluetooth headphones are often poor. The compromises between battery life and weight are tough, while the bugginess of Bluetooth makes them in turn ill-behaved. 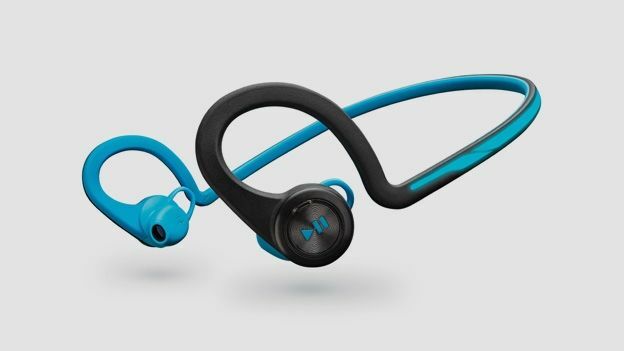 However, the Plantronics BackBeat FIT wireless stereo headphones surmount these major difficulties at a brisk 10k pace - meaning that these are among the best headphones for running. The first thing you'll notice about the BackBeat FITs are their size - they're not as massive as you might expect. Quite how Plantronics has made them this size and still managed a 24g weight with a claimed battery life of 8 hours is frankly witchcraft, and we're not discussing it here. Seriously though, they're unobtrusive and weigh about the same as many wired alternatives. They also claim to be sweat proof, with a p2i coating to help liquids and water to run off. Showers certainly had no effect during testing, and the FITs have carried on undaunted. The FITs sport a flexible band connector between the earpieces that runs behind the wearer's neck. We actually prefer a rigid band to allow casual doffing and re-doffing of ones running 'phones as required, but that's a personal thing. The rear edge of the cable has a reflective line, which is one less reason to be flattened while running at night, and thus something we broadly applaud. The flexy band can flap around a little, especially if you're wearing a hood or high collar, but the fit is rarely compromised and they never feel insecure. Given the low weight, these are pretty comfy. Critically they stay put - certainly during normal running. We used them over several half marathon distances without incident, and the 8hr battery life should see even the slowest complete a full marathon if desired. On the flipside, that's nearly a week of running tunes before you need to recharge - via a micro USB, so no weird charger nonsense either. We were initially worried that the phone controls would be intrusive - a classic error when designing BT headphones is to try and get all possible control requirements immediately available, leading to one having to remove them to work out which button you're pressing. However, Plantronics has done a good job, keeping the big central buttons dedicated to music (left side, single press is play/stop, double forward and triple back) and one on the right for answering calls. It's fairly intuitive and in-call audio quality is entirely decent, as you'd expect from a Bluetooth headset maker like Plantronics. Longevity is where the Backbeat Fit's flexibility comes to the forefront. Screwed up into the pocket of a running jacket, the test models took a fair beating without a whimper. An included neoprene armband secures your smartphone and reverses to store headphones, which is a nice touch. The company claims you'll get 8 hours of listening time, 6 hours of talk time, and 14 days of standby time, which we'd say is about right. Listening time is certainly on or near that, and standby goes on forever thanks to a DeepSleep hibernation mode, which stops the battery evaporating in your gym bag. It'll keep the FITs charged up to six months, according to Plantronics. Sound quality is decent enough, and certainly good enough for sporting applications. Testing them on tubes and trains shows up a lack of volume in very noisy environments, and to get the full bass effect you'll find yourself pushing them into your ear canals. If you're after wireless running headphones, these have to be near the top of your wishlist. They're light, easy to use, stay put effortlessly and the battery life is excellent.